Reconstruction of large bony defects after excision of tumors from long bones remains challenging. Although endoprosthetic reconstruction remains an option, it does not allow for preservation of the native joint.1 When joint preservation is possible, intercalary allograft reconstruction is an option, but it is not without complications.2 Major complications have been noted in up to 70% of patients,3–5 and these include nonunion at the allograft-host sites (15% to 55%),3,4,6–8 fracture of the allograft (27% to 30%),4–6,9 infection (14% to 18%),3,6,10 and failure of the allograft necessitating removal (15% to 31%).3,4 Osteosynthesis techniques include plate fixation, nail fixation, and combined techniques.11,12 Plate fixation allows for direct and controlled compression across the osteotomy sites but lacks the load-sharing properties of an intramedullary implant.13 Intramedullary implants can provide long-term protection of the allograft across its entire length.14 Traditional intramedullary implants do not provide compression and can lead to gap formation at the osteotomy sites. This likely contributes to nonunions occurring more frequently with intramedullary nails alone.4,14,15 There have been attempts to improve union rates by using autogenous bone graft, bone morphogenetic protein, bisphosphonates, and electromagnetic field exposure.16–20 Unfortunately, these strategies have not shown significant improvements in healing. There is a potential benefit to using an implant that is a load-sharing device, protects the entire length of the allograft, and provides compression at the osteotomy sites. The authors present a novel technique of using magnetic growing intramedullary nails to compress across the entire allograft and particularly at the allograft-host sites. This technique also offers the opportunity to noninvasively compress the osteotomy sites as well as lengthen the bone at a later time through a minimally invasive approach. This study received institutional review board approval. 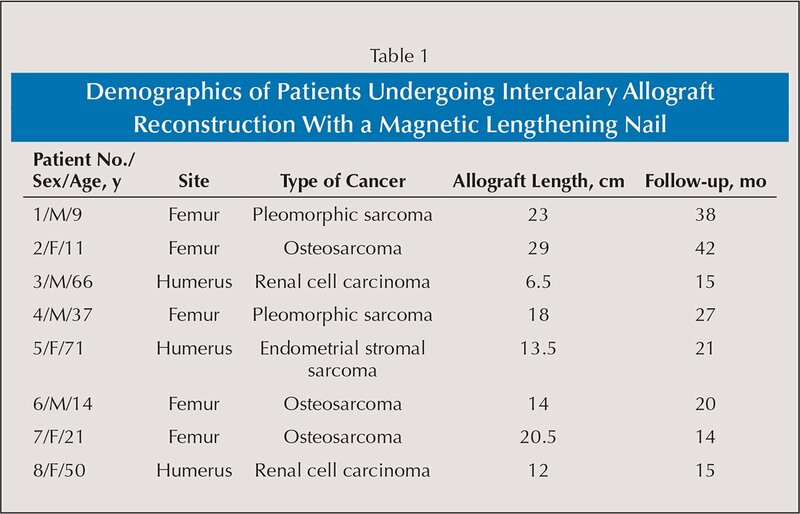 A retrospective review of all patients who underwent placement of a PRECICE nail (NuVasive Specialized Orthopedics, Aliso Viejo, California) to compress an intercalary allograft after tumor resection between 2015 and 2017 was performed. Nine patients were identified. One patient died of development and progression of distant disease prior to follow-up, leaving 8 patients with a total of 15 osteotomy sites. The patients' average age was 35 years (range, 9–71 years), and they had an average follow-up of 24 months (range, 14–42 months). The pathologic diagnoses consisted of 2 pleomorphic undifferentiated high-grade sarcomas, 3 conventional high-grade osteosarcomas, 1 metastatic endometrial stromal sarcoma, and 2 metastatic renal cell carcinomas. Four patients were male and 4 were female. Five patients received both neoadjuvant and adjuvant chemotherapy, and 3 patients received only adjuvant chemotherapy. One patient received neoadjuvant radiation to the surgical site. One patient was treated for a nonunion of 1 of 2 osteotomy sites that occurred with previous placement of a carbon fiber intramedullary nail (CarboFix, Ocean Isle Beach, North Carolina). The surgery was performed on 5 femurs and 3 humeral shafts. No autograft was used. The average allograft length was 17 cm (range, 6.5–29 cm). Twelve of the 15 osteotomy sites were diaphyseal, 2 were epiphyseal, and 1 was metaphyseal. Patient demographics are summarized in Table 1. All surgical procedures were performed by the same fellowship-trained orthopedic oncologist (L.M.Z.). During resection in pediatric patients, a portion of the periosteum was preserved if it was possible to do so without violating the tumor bed. Cooling measures with normal saline irrigation were used to minimize damage to the host bone during resection. 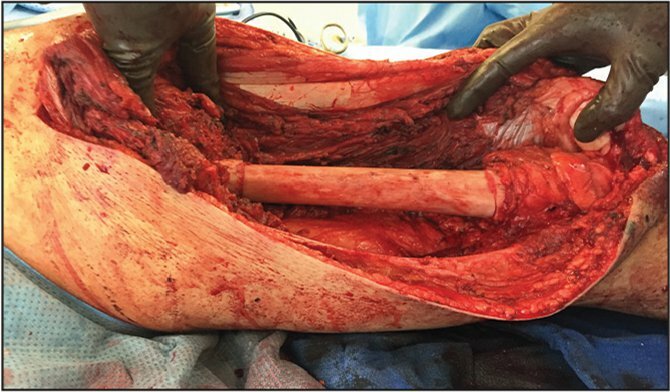 Following resection, the length of the removed bone was measured and the allograft was cut to size. The host bone was prepared in standard fashion for placement of the intramedullary nail. 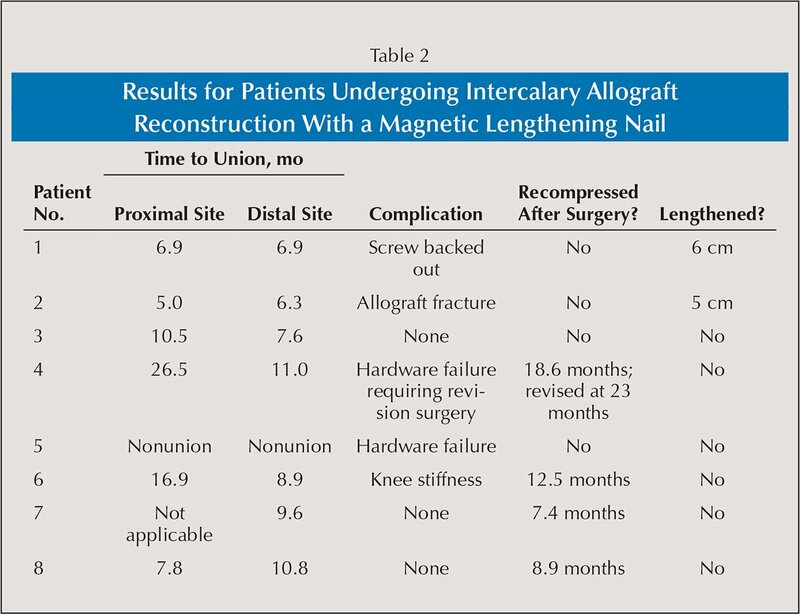 The intercalary allograft was reamed on the back table 2 mm above nail size prior to placement. The magnetic growing intramedullary nail was then lengthened on the back table if necessary and then placed in standard fashion through the host and allograft bone. Because the nails are straight, a mismatch of the osteotomy sites was common. If a mismatch with gapping greater than 5 mm occurred, the nail was removed and the osteotomy sites were shaped for appropriate bony contact between the graft and host bone. The allograft and host bone were etched with a saw or rasp to increase the surface area. Only perpendicular cuts to the long axis of the bones were performed with no step-cuts. If any host-allograft mismatches of less than 5 mm were noted, further allograft was placed to fill the gaps. Gaps larger than 2 mm were filled with cancellous chips and a cellular bone allograft (Trinity bone graft; Orthofix, Lewisville, Texas). Small gaps were filled only with the cellular bone graft. The bones were then manually compressed, and proximal and distal interlocking screws were placed into the host bone. In the case of the nonunion, the proximal locking screws were placed in the host bone proximal to the healed osteotomy site and distal to the nonunion. The nail was then compressed using the external remote controller, with towels placed between the bone and magnet to simulate the distance the soft tissue would normally provide (Figure 1). The compression was performed under direct visualization and fluoroscopic guidance to ensure there was no hardware failure or fracturing of the allograft or host bone. Compression was performed until the allograft was rotationally stable and no gapping was noted (Figure 2). The patients were followed with radiographs to evaluate union rate, time to union, and any complications. All patients were seen postoperatively by the same treating physician. Intraoperative photograph showing the external remote controller being used during surgery. Towels were placed between the nail and the external remote controller to simulate the distance that would occur if the skin were intact. Compression was performed until the graft was rotationally stable and no gapping was noted. Intraoperative photograph of a femur after compression of the allograft. The graft was noted to be rotationally stable, with no gapping of the osteotomy sites. During follow-up, patients were kept non–weight bearing until bridging bone was noted at 3 cortices. Range of motion exercises were started after 2 weeks when the incisions were healed. The osteotomy was considered healed if bridging bone was noted and the osteotomy site was not fully visualized. If no progression of union was seen after 7 months, the nail was noninvasively compressed. Other than compression, no treatment was performed after the initial surgery to the osteotomy sites. If necessary, the bone was lengthened after union had fully occurred and the patient was not receiving chemotherapy. This was performed through a small incision with a corticotomy through the host bone with drill bits followed by osteotomes. During lengthening, the patient was kept non–weight bearing until consolidation of the bone was noted. Thirteen (87%) of the 15 allograft-host sites had healed at the latest follow-up, with 12 (80%) of the 15 doing so without a second surgery. The average time to union after a single surgery was 9 months (range, 5–17 months). Bone reabsorption at 1 diaphyseal site was seen in all patients at an average of 3 months (range, 2–4 months) (Figure 3). Three of these patients had remodeled and healed uneventfully at an average of 7.2 months (range, 5–10.4 months). Four patients were recompressed noninvasively when no progression of union was noted at an average of 11.9 months (range, 7.3–18.6 months). Three of these patients healed at an average of 2.8 months (range, 1.8–4.3 months) after recompression. The bone reabsorption and remodeling that occurred at 1 diaphyseal site in all primary reconstructions. Anteroposterior radiograph of the proximal femur immediately postoperatively showing a mismatch of the host-allograft site that was filled with additional allograft bone (A). At 3.6 months postoperatively, anteroposterior radiograph showing reabsorption and remodeling at both the medial and lateral aspects of the host and allograft bone (B). Anteroposterior radiograph 12 months postoperatively showing uneventful healing and consolidation of the allograft (C). Two of the nonunion sites occurred in the same humerus. Both sites were diaphyseal, and the patient had undergone neoadjuvant radiation with a cumulative dose of 75 Gy. The patient was also receiving long-term chemotherapy for metastatic sarcoma with 152 mg of docetaxel and 2029 mg of gemcitabine. There was an associated loosening of the humeral implant with failure of the distal locking screws. The patient had a painless, functional limb at the most recent follow-up. The third nonunion occurred at the diaphyseal site of a femur in a patient receiving long-term chemotherapy for metastatic sarcoma. The patient originally received 175 mg of doxorubicin and 232 mg of cisplatin for 7 months. He was then switched to 1917 mg of gemcitabine and 107 mg of docetaxel after progression of metastatic disease was identified. The patient underwent a secondary compression at 18.6 months and had failure of the implant at 23 months. Prior to the failure of the hardware, the patient had been ambulating without difficulty. 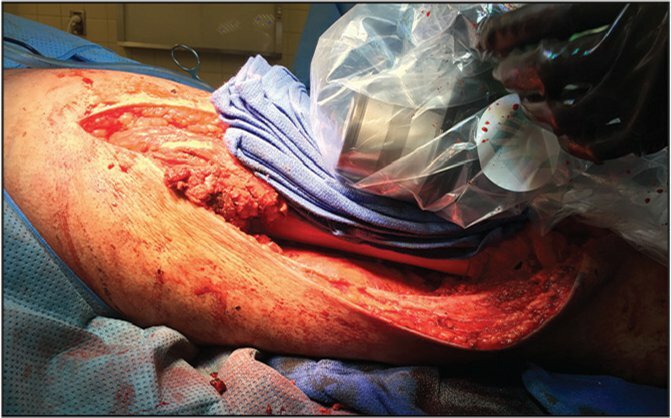 The patient subsequently underwent revision of the hardware with revision and compression of the osteotomy site. There was evidence of healing 3.5 months after his second surgery (Figure 4). Lateral radiographs of a femur after resection of a pleomorphic sarcoma and reconstruction with an 18-cm allograft. At 23 months postoperatively, the proximal site had a persistent nonunion with failure of the nail at the distal locking screw hole (A). Good compression at the osteotomy site immediately after revision surgery (B). 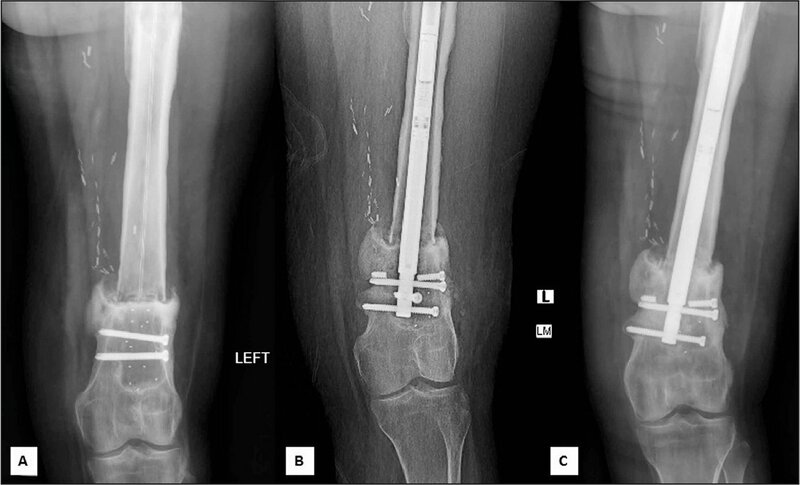 Healing of the osteotomy at 3.5 months after revision surgery (C). All patients had an R0 resection, and no patient had developed a local recurrence at latest follow-up. One major complication occurred when a patient fell and sustained a fracture through the allograft after the osteotomy sites had healed. A separate patient had a minor complication with backing out of a locking screw that required surgical removal. A third patient required a manipulation of his knee under anesthesia because of stiffness. Two patients underwent a subsequent successful lengthening of 5 and 6 cm, respectively, for an acquired limb-length discrepancy (Figure 5). The results are summarized in Table 2. Immediate postoperative anteroposterior and lateral radiographs of a femur after resection of a pleomorphic sarcoma and reconstruction with a 23-cm allograft (A). At 5.5 months postoperatively, anteroposterior radiograph of the femur showing progressive healing of the allograft with backing out of the distal locking screw (B). Anteroposterior radiograph of the femur 13 months postoperatively showing complete healing of the allograft with subsequent removal of the distal locking screw (C). Anteroposterior radiograph of the proximal femur during the limb-lengthening process that started 15.5 months after the initial surgery (D). The femur was lengthened a total of 6 cm. Complete healing is noted on anteroposterior radiographs of the femur at 3 years after the initial surgery (E). Intercalary allograft reconstruction following tumor resection remains a significant challenge. 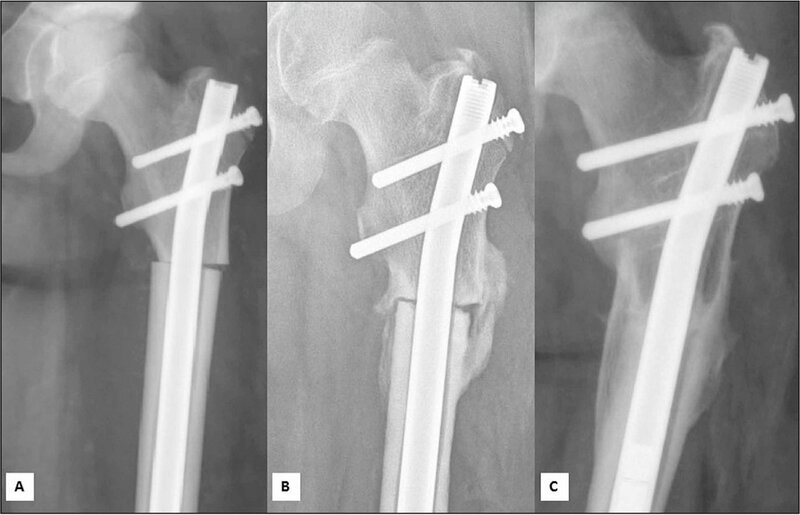 Fixation with intramedullary nails in compression provides the load-sharing stability of an intramedullary device with an opportunity for controlled compression at the osteotomy sites. This study had an 87% union rate at final follow-up and an 80% union rate after a single surgery including successful treatment of a prior nonunion (Figure 6). This technique also allowed 2 patients to undergo lengthening using the same implant. Anteroposterior radiograph of the femur showing a nonunion of the distal osteotomy site with associated hardware failure in a patient previously treated with a carbon fiber nail. The patient had an osteosarcoma of the femur treated with a 20.5-cm intercalary allograft. The nail failed, as indicated by the loss of continuity of the radiopaque markers distally, whereas the proximal osteotomy healed (A). Antero-posterior radiograph immediately postoperatively showing good compression of the osteotomy site (B). At 9.6 months postoperatively, healing of the osteotomy site was noted (C). This rate of healing is improved from that of many published studies. Plate and screw fixation is thought to have a higher union rate but with a higher fracture rate,3,4,14 although some argue that there is an equivalent union rate.14 A study by Frisoni et al4 of 114 femur tumors showed that 46.5% of femurs had at least 1 non-union at 1-year follow-up. This occurred with patients undergoing either plate or nail fixation but was significantly greater with the use of nails. Eight of 10 in that study had a failure of osteosynthesis with nails compared with 17 of 103 for plates. Other factors related to nonunion included adjuvant chemotherapy, bone resection greater than 17 cm, and the osteotomy line placed greater than 5 cm from the joint. Patients older than 18 years had a nonsignificant trend toward delayed union. Chemotherapy has been shown to increase the nonunion rate from 11% to 27%.8 Gharedaghi et al24 showed higher rates of nonunion after both radiation and chemotherapy. Bus et al3 reported a non-union rate of 25% at 1 year, with 40% of patients requiring surgical intervention to aid union. Nonunion risk was increased with nail-only fixation. Compressing a nail showed promising results in 1 prior study. Miller and Virkus11 used a compression screw with a standard intramedullary nail (T2 nailing system; Stryker Orthopaedics, Mahwah, New Jersey). Thirteen of 15 junctions had healed by last follow-up. Confounding factors included patients with previous failures and revisions. Adjuncts such as autogenous bone graft, supplementary plate fixation, and bone morphogenetic protein were also used to obtain union. Bone reabsorption was seen in all patients at 1 of the diaphyseal osteotomy sites between 2 and 4 months postoperatively. Watson and Sanders25 recommend compressing the nail multiple times in the postoperative period when treating humeral shaft fractures. Their protocol involves compressing the fracture site every 2 weeks until no gapping is noted. This is followed by compressing the nail 0.33 mm every 3 weeks until union is noted. Further research should be conducted to determine whether a similar protocol would lead to improved union rates or earlier union when allograft bone is used. This is the first study to evaluate the use of electromagnetic intramedullary growing nails in compression to aid in allograft incorporation. The findings of this study are limited by the fact that only 15 osteotomy sites in 8 patients were evaluated. Only allograft, which avoids the surgical risks and morbidity of autograft, was used. The results are promising, as allograft length, diaphyseal location, and standard postoperative chemotherapy did not result in nonunion in most patients. Both patients who went on to nonunion were adults with large allografts in diaphyseal locations who were receiving long-term chemotherapy for metastatic sarcoma, with 1 patient receiving neoadjuvant radiation. One of these patients went on to union after revision surgery. In this series, 3 complications occurred in patients who went on to union. A major complication included a fracture through the allograft. This is not uncommon, with Bus et al3 reporting a 29% fracture rate. There were 2 minor complications—a screw backing out and 1 patient requiring a manipulation under anesthesia. There were no infections in this series. Expected limb-length discrepancies were treated using a minimally invasive approach with the same implant. Alman et al6 noted that 60% of their pediatric patients developed a limb-length discrepancy of greater than 2 cm. Several of their discrepancies were treated with an epiphysiodesis of the contralateral extremity. The current technique resulted in symmetric leg lengths at latest follow-up. This technique can allow some patients to reach their natural height with 1 implant. Depending on the type and the size of the nail used, between 2 and 8 cm of lengthening is possible. The femoral nails used in these patients allow up to 8 cm of lengthening and, if necessary, further lengthening can be performed. If a significant discrepancy occurs and the implanted nail does not have capacity for further lengthening, epiphysiodesis, exchange nailing, or another method of lengthening could be used. Preoperative planning with an estimation of height at maturity and evaluation of the lengthening capacity of the nail should be used to counsel patients and their families about treatment options. Although large intercalary allografts provide a good reconstructive option, complications are common. The optimal fixation technique remains unclear. This technique provides a viable option with benefits of both plate and nail fixation. Intramedullary nailing in compression provides load-sharing stability and allows for controlled compression across the osteotomy sites. The complications and the fusion rates found in this study were comparable to or an improvement over those of most published research. Future studies should examine longer-term outcomes and late complications. Additionally, it is uncertain how much compression is optimal for osteotomy site healing and whether scheduled, noninvasive compression of the nail in the office would aid in healing. Although additional research and longer-term follow-up need to be completed, early results are promising and indicate that this technique is a good option for intercalary allograft reconstruction. Delloye C, van Cauter M, Dufrane D, Francq BG, Docquier PL, Cornu O. Local complications of massive bone allografts: an appraisal of their prevalence in 128 patients. Acta Orthop Belg. 2014;80(2):196–204. Wang JW, Shih CH. Allograft transplantation in aggressive or malignant bone tumors. Clin Orthop Relat Res. 1993;297:203–209. Capanna R, Donati D, Masetti C, et al. Effect of electromagnetic fields on patients undergoing massive bone graft following bone tumor resection: a double blind study. Clin Orthop Relat Res. 1994;306:213–221. Delloye C, Suratwala SJ, Cornu O, Lee FY. Treatment of allograft nonunions with recombinant human bone morphogenetic proteins (rhBMP). Acta Orthop Belg. 2004; 70(6):591–597. Taguchi Y, Pereira BP, Kour AK, Pho RW, Lee YS. Autoclaved autograft bone combined with vascularized bone and bone marrow. Clin Orthop Relat Res. 1995;320:220–230. Miller BJ, Soni EE, Gibbs CP, Scarborough MT. Intramedullary nails for long bone metastases: why do they fail?Orthopedics. 2011;34(4):274. Gharedaghi M, Peivandi MT, Mazloomi M, et al. Evaluation of clinical results and complications of structural allograft reconstruction after bone tumor surgery. Arch Bone Jt Surg. 2016;4(3):236–242. The authors are from the Department of Orthopedic Surgery, Loma Linda University Medical Center, Loma Linda, California. Drs Vercio and Shields have no relevant financial relationships to disclose. Dr Zuckerman is a paid consultant for NuVasive Specialized Orthopedics. Correspondence should be addressed to: Lee M. Zuckerman, MD, Department of Orthopedic Surgery, Loma Linda University Medical Center, 11406 Loma Linda Dr, Ste 218, Loma Linda, CA 92354 ( lzuckerman@llu.edu).